(Database is opened to “Immunonutrition”) D’Coda; There’s a new field of nutrition called Immunonutrition. Given that Lyme is really about the dysregulation, and in chronic Lyme, chronic dysregulation of the immune system, the are now exploring nutrition from the perspective of how it directly impacts the functioning of the immune system itself. Here (in the database) you read scholarly research on what they’re finding. I’m still working on this section but here are some of the nutrients that have a direct affect on the immune system. When we’re developing our diet (we’ll get into that later) you want to pay attention to antioxidants, that’s a broad spectrum of different things with an affect on the immune system. 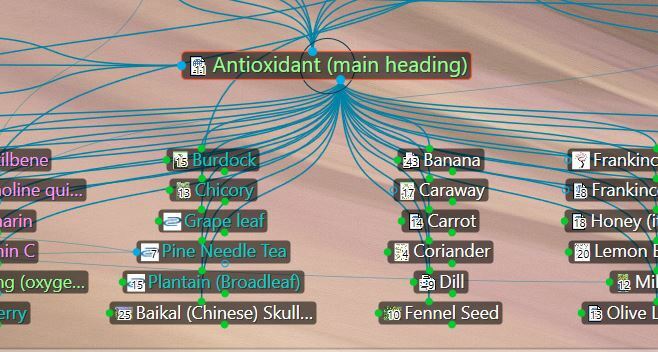 (The database is opened to the section on Antioxidants). These are substances that have a strong antioxidant effect. 1:45 – For example, Arginine, which is an amino acid, an interesting thing about that (and there are cautions) is that it increases Nitric Oxide. By the way, Nitric Oxide is something Borrelia doesn’t like. Hemp seeds are high in it, nuts and oats. 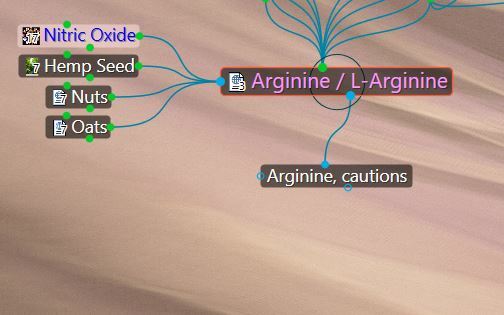 One of the things Arginine does is it enhances T-cells. 2:17 (Database opened to Dietary Nucleotides) Dietary Nucleotides, this is a whole new area that they’re looking at. 2:23 (Database is viewed for Late Stage Lyme, Dangers of Self-Medication, Lyme in Pregnancy/Pediatric,) Late stage lyme is handled differently. What if you’re pregnant? Or it’s a child, that’s what this section is about. If you’re going into antibiotics, learn about them, make sure your doctor is cycling them. We’ll do another show on antibiotics. And, make sure your doctor is using a pulse therapy. In other words, they’re not used day in and day out. They are used for a short period of time and stopped. And rotated. As I recall, Dr. Jemsek and Dr. Neilson, use a pulsed protocol. They give antibiotics Monday, Wednesday and Friday twice a month. The rest of the month they’re using Buhner’s protocol which is available in something called LD-Core, a pill that has all of his essential herbs. Of course, they also use all of the lifestyle changes. 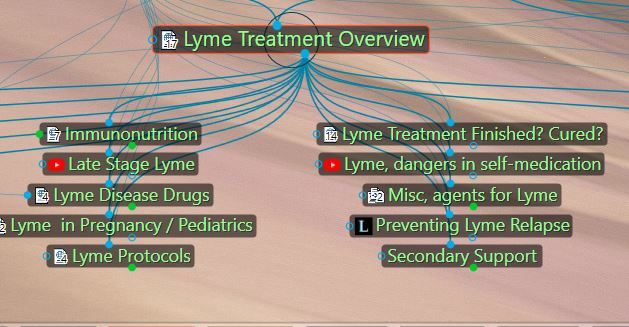 3:44 (Database opened to section titled “Lyme Treatment Finished? Cured?”) There is no test to say that Lyme Disease is cured. In fact, two of the leading researchers in this type of organism, they’re called “cell wall deficient stealth organisms” was Lida Maddow and Joanne Whitaker. They had a major laboratory to research those organisms. They took samples from many test subjects, found Borrelia in virtually all of them. And they tested them after all kinds of treatments, there was still Borrelia in these patients. That’s why some doctors will say, if they’re thinking of a cure in terms of elimination of Borrelia from the body, they’ll say there is no such thing as a cure. We aren’t going to get into chronic Lyme too much in this show but that’s another huge topic. 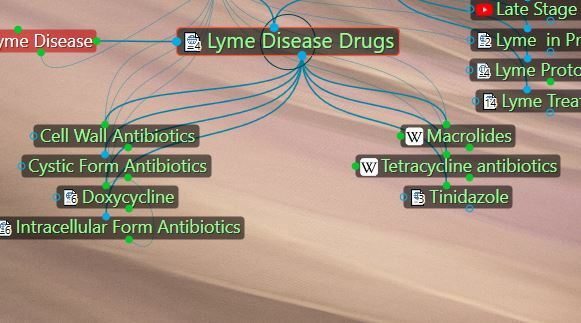 4:55 (Database is opened to a new topic “Miscellaneous Agents for Lyme). These are not herbal although them may be related, for example, berberine is a substance in a lot of herbs and is also available as a supplement. Nanosilver, Nattokinase (an enzyme), Lumbrokinase (from earthworms). 5:22 (Other sections of the database are shown “How to Prevent a Lyme Relapse” and “Secondary Support”) Secondary support is really primary because its about the probiotics and there are recommendations here for good probiotics. None of them can replace the fully damaged microbiome of the gut and that’s why we’re hesitant to use antibiotics too much. But, they help. This section also shows you some products for immune support, detoxification, and different types of supplements that can be used. How to do a Candida cleanse. If you’re using antibiotics the odds of developing a Candida problem are increased significantly. 6:19 (The Database section on Support Groups for Lyme is shown). 6:25 – Let’s go to the Protocols because this where people can really hone in. I’ve looked at all these protocols closely and I’m sure there are still others I haven’t discovered yet and if any of you are on them please let me know because I’d like to explore all of them. What is lacking is the ability to compare them. To say, for example, that of 500 patients taking Buhner’s protocol, x number were so-called “cured”, in other words, no more symptoms. And of 500 taking the Jemsek protocol, x number were cured. So, to be able to say this one works better than that one. We don’t have that. Part of the problem is Lyme is expressed differently in every individual. And the doctors who are good at this modify their protocols according to different types of lab tests that they’re doing, exploring the patient’s terrain. Now this is where it gets really interesting. 7:38 – You may recall that germ theory is the driver behind our approach to infectious disease. Germ theory was developed by Pasteur and Pasteur had a nemesis, you might say, a fellow scientist of his time called Bechamp. Bechamp held to the age-old theory which still stands in herbal medicine, naturopathic medicine, and biological medicine, that its not the germ that causes the disease, it’s the terrain, the ground, the constitution. In other words, everything that’s going on in the human body sets the stage for the take over by some type of pathological organism. That in a healthy body, all of these different pathogens are held in check. If you correct the ground, the terrane, bring it into balance, then its not possible for any of these pathogens (with the exception of a few very remote pathogens like ebola that have been kept in isolation from the human ancestral experience – there aren’t many of those.) Part of the reason is the human immune system, the human body, has lived with all of these organisms for a very long time. The immune system and the body are wise, they learn from their ancestral experience. That knowledge base is passed on from generation to generation. When we encounter these things, our bodies know what to do. On Pasteur’s death bed, his final words were “Bechamp was correct, it’s the ground. Not the germ.” Even he, came around to it. And that’s where we’re coming back to today in our battle, battle, battle against the germ, trying to kill the germs. Remember, we are made up of bacteria, primarily. There are 10 times more micro-organisms making up our body, in a beneficial way, than there are human cells. When we start killing off life with antibiotics, and that’s actually literally what that means, biotic means life, we’re doing damage to the bacteria that compose us. We’re a community of different organisms. We’ve been getting into a lot of trouble that way, so we have to think about that. 10:37 – There are protocols we have now, that’s why some of these are called “biological medicine”, that don’t even try to kill the borrelia, they don’t try to kill any of the bacteria. They work on restoring the balance of the human body. I want to jump into one of those right now that I find very interesting. They’ve been sick for a long time and been told its chronic fatigue, fibromyalgia, they’ve been given a death sentence with Lou Gehrig’s Disease, MS isn’t responding, rheumatoid arthritis isn’t responding. They’ve been alerted because of all the talk about Lyme, they may actually have Lyme. If they were to treat Lyme they may recover. But, they don’t have the money now to go for testing that they’re going to have to pay for out of their own pocket because the insurance company won’t cover a lot of these tests. They don’t have the money to go to Switzerland to Dr. Rau’s clinic, or to the Hanson clinic or these different specialists who could turn it around for them. They don’t have the money so they’re on their own. Insurance isn’t going to pay for their meds, it isn’t antibiotics so they’re not going to get covered. What are they going to do? That’s what I’m always looking out for is what can we do, those of us who have to take our health matters into our own hands. I find that Dr. Jernigan’s protocol offers a lot of hope. 13:03 (D’Coda opens the information panel on Dr. Jernigan’s protocol) These are notes I took on his Assassin’s of Lyme Bacteria video. He says its not good science to keep pounding the body with antibiotics, colloidal silver, herbs and things that bomb the bacteria. In his lab he’s produced herbal remedies that act like software to program bacteriophages to strategically seek out specific bacteria. 13:37 – What are bacteriophages? This is very interesting. (Database is opened to “Bacteriophages”) It turns out that Nature, in her wisdom, supplied the answer to this. The bacteriophage is a virus that kills bacteria. This actually what it looks like. I’ve seen pictures of it in the blood and it looks like that. This thing is incredible, why haven’t we heard about this? The bacteriophage works all over the planet, not just in our bodies but in plants, animals, soil, everywhere. There are microbial balances that work to support and nurture life on the planet. It all has to be kept in balance. If these bacteriophages were the size of lady bugs, they would cover the earth many miles deep. They find bacterial populations that are getting out of balance and they go in and destroy certain bacteria to restore balance. They’re doing that in the body without harming beneficial bacterial. 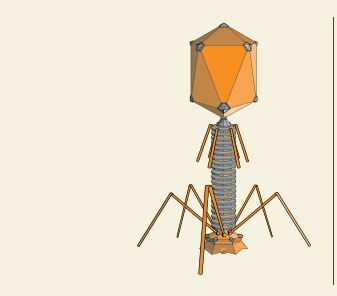 When we work on the terrain, we’re helping the bacteriophage do its job. It works directly with the immune system. There’s a partnership between them. One of the things that’s happening is our terrain has changed significantly. The foods, the environment we live in, exposures to different kinds of radiation, the terrain has changed so the normal balance of these microbes is being thrown off, allowing for stealth organisms and other organisms to come in and play havoc with our health. The objective isn’t to kill them, you do that and you just keep getting sick if the terrain isn’t fixed. 16:52 – Deerwomon: I also like to give some credit to the fact that we’re adaptable biological beings and as the planet is changing and transforming, we are also subject to that. I trust that there’s a mutation process going on here. D’Coda: Yes, but sometimes a lot of people die off in a mutation process. There are survivors. What we have to do is become the learners. The learners will inherit the earth. We have to learn what to do. We know that a lot of people are carriers of borrelia and they’re not sick. In Switzerland, Dr. Rau, at his clinic, they did research on a rural area for ticks and found a high percentage, maybe 80%, of the ticks carried Lyme. They started testing farmers and woodsmen who lived in the area for Lyme and found they were carrying a lot of borrelia but only a very small part of that population was actually getting ill.
18:22 – So just because you’ve been bit by a Lyme carrying tick, and it’s not just a tick vector, there are other vectors (blood transfusions even), doesn’t mean you’re going to get sick from it. Deerwomon – Everyone’s ground is different, our constitutions. 18:46 – (Database shows two products from Jernigen’s protocol, Borrelogen and Lymogen) I cannot prescribe on this show but I will say that if I had some type of chronic disease that wasn’t improving and learned it could possibly be Lyme, and wasn’t able to get the testing done (remember, we don’t have any reliable tests – though there may be one and we’ll cover that in another show, or just look in the database)…and I wanted to do a Lyme protocol, or I knew I had Lyme and maybe the co-infections, and didn’t’ have the $500. You don’t want to have to make a choice between paying rent, buying healthy food or buying medications. Borrelogen is not expensive. It uses a technology based on an herbal product, energetically imprinting it to work like software directly on the bacteriophage to program and enhance it to seek out borrelia. Deerwomon: D’Coda, would this only be seeking out Lyme? 21:21 – This is also working as energetic medicine. We’re using a lot of energetic medicine in treating Lyme. Western herbalism, Ayurveda, Chinese medicine, all of these are energetic medicine as they understand the energetics behind how these things work. Borrelogen is safe, it can be used by any age group, children, elders. A bottle costs $30. 22:07 – Lymogen , here’s another one. It also treats bartonella, a fairly common co-infection. It can be used for viral conditions like colds and flu. These are two easy places to start. It’s not enough to take these products, you also have to restore the terrain and there’s a lot that needs to be done alongside taking these medicines.